Every one is so much rubbish. Tis a failure that I say. Sunday school was this afternoon instead of this morning. I rather liked the preacher they had. Ruth and I. I was going to say since that is a phrase so often, but doesn’t fit in here after all. Well Ruth staid up at Helen’s and I went up to attend some kind of C.E. Union, any way that is my definition of it. Said services are to be held every night this week. Thurs. night is when we girls take part. Came home with Ruth since that was what I went up for. The road Grandma would have walked to McEwensville. This is a long entry for Grandma—yet it also seems particularly disjointed and I have difficulty following her train of thought. Grandma began the month with a poem—as she did on the 1st of every month. Many monthly poems were about the season or typical weather (the harvest in October, sweet summer in August). What was Grandma trying to say in this poem? The first line may refer to Valentine’s Day—or the unidentified guy she liked who she referred to as “he” in other entries. But then the poem seems to take a darker turn. The church must have had a substitute pastor or a preacher seeking a call. The previous preacher at Grandma’s church preached his farewell sermon on January 4. C.E. Union referred to the Christian Endeavor Union. 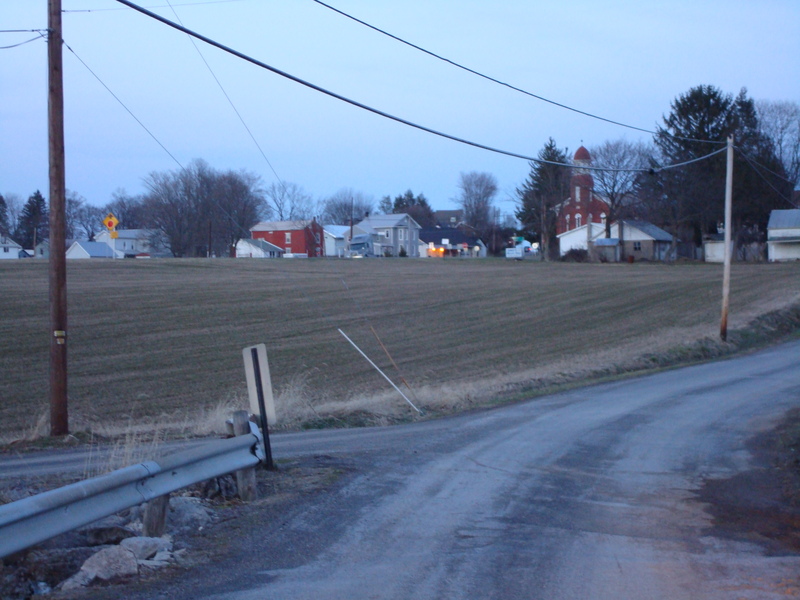 It is a nondenominational evangelical organization that periodically held events in McEwensville. On October 30, 1912 Grandma wrote about attending a Christian Endeavor convention in McEwensville. The last few days Grandma was practicing a speech. It sounds like she would give it at a Christian Endeavor event later in the week. Helen Wesner and Carrie Stout were friends of Grandma and her sister Ruth. Posted on February 1, 2014 January 31, 2014 by SherylPosted in OtherTagged family history, genealogy. I really like that poem! She wrote one every month? That’s amazing. Yes, there is a poem in the diary on the first day of each month. I”m always surprised how she followed this structure throughout the diary. I’m not sure whether she wrote the poems herself of whether she got them from some source–though I tend to lean towards thinking that she wrote them. I was wondering that too — given how popular it was then to memorize poems. Is there a way to find out? If they were original it might make a nifty little chapbook to collect them, you know? Yes, I also thought that she seemed a bit down. This entry was packed with information. It does seem that Helena was a little disheartened by humanity or a specific person as if she found them to be disingenuous. It’s hard to tell what was bothering her, but it seems like something wasn’t quite right. Grandma is definitely verbose in this one. I’m thinking the young man and Valentines Day are playing in to this. Something definitely seems different. . . . I really look forward to the monthly poems. Are you sure your grandma wrote this? She usually says so little. I do like the poem. It seems he major portion of her life is either farm or church. No, I’m not sure that she wrote it. During the early months of the diary, I used to try to figure out whether she wrote the monthly poems or whether she was getting them from somewhere. So many of the poems haven’t really seemed like they were written by professional writer–that, over time, I’ve gravitated toward thinking that she probably wrote them but I’m really not sure. Though this one may provide support for the idea that she got them from somewhere. I too noticed the long entry … it must be heard to try to interpret her thoughts. She was definitely did not run off at the mouth! I had to read that one a few times. It was very hard to follow. Sounds like she had a thought to think about. Thanks for the clarifying information – it helped me to make some sense of Grandma’s entry.